Department of Pharmaceutics 1, Department of Quality Assurance 2, SVKM’s Dr. Bhanuben Nanavati College of Pharmacy, Mithibai College Campus, V. M. Road, Vile Parle (West), Mumbai - 400056, Maharashtra, India. 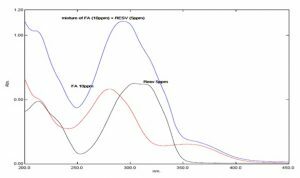 ABSTRACT: A simple and precise UV-Visible spectrophotometric method for the simultaneous estimation of Resveratrol and folic acid in fixed-dose combination (FDC) has been successfully developed and validated. A suitable FDC of Resveratrol and folic acid was formulated for the treatment of oral squamous cell carcinoma. The present method involves the application of simultaneous equations (Vierodt’s method) for quantification of both the drugs. Resveratrol and folic acid were found to have absorbance maxima at 303.4 nm and 280.2 nm respectively in simulated saliva pH 6.8: methanol (1:1). The linearity studies indicated a concentration range of 1-7 ppm and 7-13 ppm for Resveratrol and folic acid respectively. The high values of the correlation coefficient indicate good linearity of the calibration curve for both the drugs. The recovery of Resveratrol and folic acid was found to be between 95.368 ± 0.364% and 101.260 ± 0.270% for Resveratrol and 101.330 ± 5.834% and 105.229 ± 0.1.164% for folic acid. The recovery results indicated that this method was suitable for simultaneous estimation of Resveratrol and folic acid in an FDC, i.e., mucoadhesive orogel. INTRODUCTION: Chemoprevention of cancer is gaining significant importance in the field of cancer treatment. It is an approach which uses natural, synthetic or biological agents for reversing, suppressing or preventing the carcinogenic progression in normal or high-risk population 1. Some polyphenols from herbal origin like quercetin, resveratrol, curcumin, G. biloba, ellagic acid have been explored for management of oral, head and neck carcinoma. Combination approach provides a means of obtaining increased efficacy with minimal toxicity, wherein both the agents work synergistically 2. Resveratrol is a phytoalexin (trans-3, 5, 4’-trihydroxystilbene) obtained from the skin of grapes, blueberries, cranberries, red and white wine, and other food products. It is known to have a potent antioxidant effect and has widely been explored for its chemopreventive and chemotherapeutic activity. Studies have shown that Resveratrol inhibits all three stages of carcinogenesis 3, 4, 5, 6. Folic acid is (2S) -2 -[[4 -[(2-amino- 4 -oxo -1H-pteridin-6 -yl) methyl -amino] benzoyl] amino] pentanedioic acid. It is indicated for prevention and treatment of folate deficiency conditions. Folic acid is essential for normal DNA synthesis 7; its deficiency can cause an imbalance in DNA precursors leading to uracil misincorporation into DNA and alteration in DNA methylation thereby inducing malignant transformations. The chemical structures of Resveratrol and folic acid are given in Fig. 1. There are some analytical methods for analysis of Resveratrol in combination with other phytochemicals like quercetin, etc. The combination of Resveratrol and folic acid has therapeutic significance, especially for the management of oral squamous cell carcinoma (OSCC). 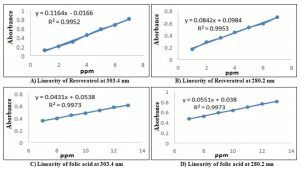 There were no reports on simultaneous analytical methods for estimation of Resveratrol and folic acid; our attempt is to develop a simultaneous equation method using UV-Visible spectroscopy. The present paper describes the development of Vierodt’s spectrophotometric method 8, 9, 10 for simultaneous estimation of Resveratrol and folic acid in mucoadhesive orogel. The proposed method was developed and validated as per ICH guidelines. Instrumentation: SHIMADZU double beam UV visible spectrophotometer (model 1800) with 1 cm matched quartz cells over the range of 200-400 nm was used for the measurement of absorbance. Chemicals and Reagents: Folic acid was purchased from S. D. Fine. Mumbai, Resveratrol was obtained as a gift sample from Meyer Organics Pvt. Ltd., Mumbai. Methanol AR, sodium chloride, potassium phosphate monobasic, sodium phosphate dibasic was purchased from S. D. Fine. All the reagents and chemicals were of AR grade. Double distilled water was used to prepare solutions in this study. Preparation of Simulated Saliva pH 6.8: Simulated saliva was prepared using 8 g of sodium chloride, 0.19g of potassium phosphate monobasic, 2.38 g of sodium phosphate dibasic. These were dissolved in 100.0 ml of double distilled water. The pH was adjusted to 6.8 pH using orthophosphoric acid. Preparation of Standard Stock Solution: Standard stock solutions of folic acid and Resveratrol were prepared in simulated saliva pH 6.8: methanol (1:1). 10 mg of folic acid and Resveratrol respectively were dissolved in 10 ml of simulated saliva pH 6.8: methanol (1:1) to give 1000 ppm of stock solution. Preparation of Working Solution: Individual working solutions of concentration 10 ppm of folic acid and 5 ppm of Resveratrol were prepared from standard stock solutions respectively. A solution containing 10 ppm of folic acid and 5 ppm of Resveratrol was prepared as a standard mixture. Development of Simultaneous Method: Simultaneous equation method for analysis of Resveratrol and folic acid was developed in simulated saliva pH 6.8: methanol (1:1) using absorption maxima of Resveratrol and folic acid at 303.4 nm and 280.2 nm respectively. To quantify Resveratrol and folic acid in orogel formulation, the simultaneous method was first developed for the estimation of pure drugs in standard mixture. Working solutions of 10 ppm of Resveratrol and 5 ppm of folic acid were scanned individually over the range of 200-400 nm. The absorbance was measured at 280.2 nm and 303.4 nm in 1 cm cell using simulated saliva pH 6.8: methanol (1:1) solvent as blank. Absorbance Additivity Effect: Absorbance additive effect for folic acid and Resveratrol in combination was carried out by dissolving folic acid and Resveratrol (2:1) in simulated saliva pH 6.8: methanol (1:1). Where, CX and CY = Concentration in (mg/mL) of folic acid and Resveratrol respectively in the mixture in simulated saliva pH 6.8: methanol (1:1). A1 = Absorbance of the mixture at 280.2 nm. A2 = Absorbance of the mixture at 303.4 nm. ax1 and ax2 are absorptivities of folic acid at λ1 (280.2 nm) and λ2 (303.4 nm) respectively. 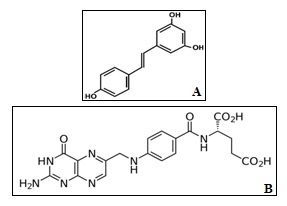 ay1 and ay2 are absorptivities of Resveratrol at λ1 (280.2 nm) and λ2 (303.4 nm) respectively. A (1% 1 cm) = Absorptivity value for respective wavelength. Analytical Method Validation Studies: Validation of an analytical method is widely accepted as pivotal before they are put into routine use. A method must be tested for effectiveness and must be appropriate for the particular analysis to be undertaken. Method validation is defined as the process of proving, through scientific studies, that the analytical method is acceptable for its intended use and it instills confidence that the method can generate test data of acceptable quality. The International Conference on Harmonization has issued guidelines for analytical method validation [ICH Q2 R1]. Linearity: Linearity studies were carried out at an excitation wavelength of both the drugs i.e. 303.4 nm and 280.2 nm of Resveratrol and folic acid respectively. Working solutions of concentrations (1-7 ppm) of Resveratrol and (7-13 ppm) of folic acid were prepared from respective stock solutions. 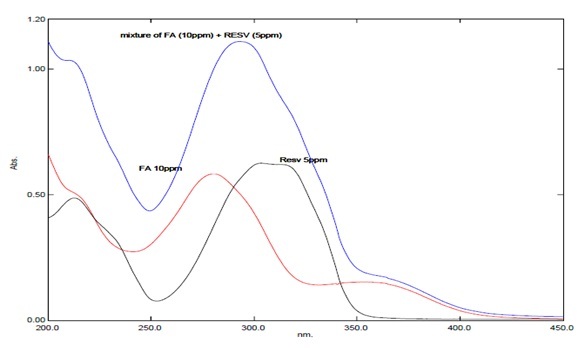 The absorbance was measured at excitation wavelength of Resveratrol (303.4 nm) and folic acid (280.2 nm). A calibration curve was obtained by plotting absorbance values against the concentration of Resveratrol and folic acid. Precision: Precision quantifies the variability of analytical results as a function of the operator, method manipulations and day to day environment. The precision of method was determined by performing inter-day variation, intra-day variation, and repeatability studies. In an inter-day variation, the absorbance of sample solutions of Resveratrol (4 ppm) and folic acid (10 ppm) was measured on two consecutive days. In repeatability studies, six determinations of concentration (4 ppm) of Resveratrol and (10 ppm) of folic acid were analysed. Accuracy Studies: Accuracy of an analytical method is the closeness of test results obtained by that method to the true value. To study the accuracy of the developed method, recovery studies were carried out by standard addition method, by spiking 80%, 100% and 120% of Resveratrol and folic acid to pre-analysed orogel and percentage recoveries were calculated. Robustness: Robustness of the method was determined by varying the pH of solvent (simulated saliva pH 6.8: methanol (1:1)) by ± 0.2. Application of Simultaneous Equation Method on Mucoadhesive Orogel Formulation: The developed simultaneous equation method was applied for determining assay of Resveratrol and folic acid in mucoadhesive orogel. 0.5 g of gel was dissolved in 10.0 ml of simulated saliva pH 6.8: methanol (1:1). The absorbance was measured at 280.2 nm and 303.4 nm. RESULTS AND DISCUSSION: From the overlay spectra of folic acid and Resveratrol λmax of folic acid and Resveratrol was found to be 280.2 nm and 303.4 nm respectively Fig. 2. Absorbance additive effect was observed when both drugs were analyzed in combination Table 1. The developed simultaneous equation method under the established conditions showed good correlation with Beer's law over the concentration range from 1-7 ppm and 7-13 ppm at excitation wavelengths 280.2 and 303.4 nm with the regression equation y = 0.1164x - 0.0166 and y = 0.0551x + 0.038 respectively. The correlation coefficient was found to be 0.995 for Resveratrol and 0.997 for folic acid Fig. 3. A relative standard deviation of 0.527 % and 0.556% was observed on analysis of six replicate samples for repeatability studies carried out at excitation wavelengths of both the drugs. The results of recovery studies demonstrated that the developed method was accurate. Both inter-day, as well as intra-day precision studies, were carried out in different concentration of the solutions and the relative standard deviation (RSD) was found to be less than 2% Table 2. The percent recovery studies revealed that after 80%, 100% and 120% spiking the value lies between 95.368 ± 0.364% and 101.260 ± 0.270% for Resveratrol and 101.330 ± 5.834% and 105.229 ± 0.1.164% for folic acid Table 3. The limit of detection was found to be 0.073 and 0.102 ppm, and the limit of quantification was found to be 0.223 and 0.310 ppm for Resveratrol and folic acid respectively. The developed method was found to be robust in the pH range of pH 6.8 ± 0.2 as shown in Table 4. On application of the developed method on mucoadhesive orogel, the assay of Resveratrol and folic acid was found to be 90.0% and 89.70% respectively Table 5. CONCLUSION: The developed analytical method using UV spectrophotometric Vierodt’s method is specific, accurate and precise for the simultaneous quantitative estimation of Resveratrol and folic acid in the developed FDC mucoadhesive orogel. This method can be extended to other dosage forms containing Resveratrol and folic acid in combination. The developed analytical method is suitable for routine analysis and quality control of pharmaceutical formulations containing these drugs in combination. Benetou V, Lagiou A and Lagiou P: Chemoprevention of cancer: current evidence and prospects. 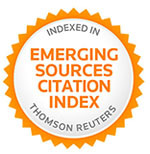 F1000 Research 2015; 4 (F1000 Faculty Rev): 916. Peterlik M, Grant WB and Cross HS: Calcium, vitamin D and cancer. Anticancer Research 2009; 29(9): 3687-98. Shan Z, Yang G, Xiang W, Pei-jun W and Bin Z: Effects of resveratrol on oral squamous cell carcinoma (OSCC) cells in-vitro. Journal of Cancer Research and Clinical Oncology 2014; 140(3): 371-4. Laura M, Enrica DS, Massimo F, Rosanna M, Monica B, Laura M, Pamela S, Chiara F, Roberta B, Ilaria T, Valerio I, Maurizio M, Giovanni V, Florigio L, Andrea M and Roberto B: Resveratrol potentiates in-vivo and in-vitro antitumoral effects of curcumin in head and neck cancer. Oncotarget 2014; 5(21): 10745-10762. Seong HK, Kim HJ, Lee MH, Yu SK, Kim CS, Kook JK, Chun HS, Park E, Lee SY, Kim SG and Kim HR: Resveratrol induces apoptosis of KB human oral cancer cells. Journal of the Korean Society for Applied Biological Chemistry 2011; 54(6): 966-71. Feng HC, Lin JY, Hsu SH, Lan WY, Kuo CS, Tian YF, Sun DP and Huang RF: Low folate metabolic stress reprograms DNA methylation‐activated sonic hedgehog signaling to mediate cancer stem cell‐like signatures and invasive tumour stage‐specific malignancy of human colorectal cancers. International Journal of Cancer 2017; 141(12): 2537-50. Shetty PR and Patil DD: Applications of simultaneous equation method and derivative method for the determination of Rabeprazole sodium and Levosulpiride in pharmaceutical dosage form and dissolution samples. Journal of Association of Arab Universities for Basic and Applied Sciences 2014; 15: 53-60. Patil LD, Gudi SV, Jadav DD, Kadam YA, Dalvi SD and Ingale PL: Development and validation of UV spectrophotometric methods for simultaneous estimation of amlodipine besylate and clopidogrel bisulfate in bulk and tablet dosage form. Der Pharma Chemica 2013, 5(4): 282-287. Grewal AS, Redhu S, Kumar K and Bhardwaj S: Analytical Methods for Simultaneous Estimation of Multi-Component Formulations: A Mini Review. 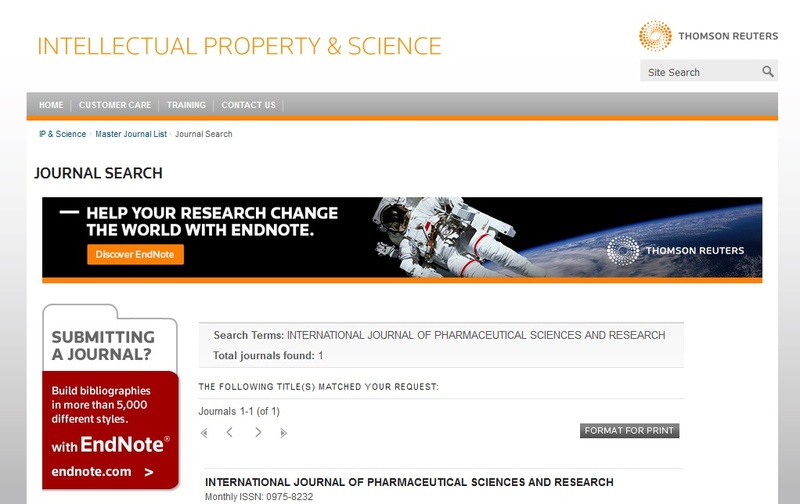 Global Journal of Pharmaceutical Education and Research 2016; 1(2): 42-9. 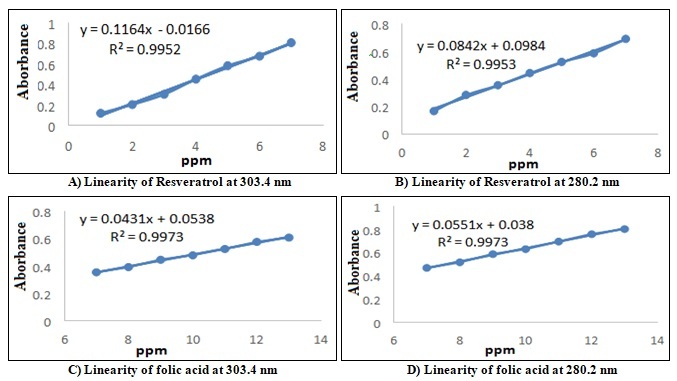 Khan T, Gharat S, Chalke M and Momin M: Development of simultaneous spectrophotometric method for quantification of Resveratrol and folic acid in an orogel. Int J Pharm Sci & Res 2019; 10(4): 2035-39. doi: 10.13040/IJPSR.0975-8232.10(4).2035-39. Authors Address: Department of Pharmaceutics, SVKM’s Dr. Bhanuben Nanavati College of Pharmacy, Mithibai College Campus, Mumbai, Maharashtra, India.